Rangers have been made aware of interest in manager Mark Warburton from Fulham and are concerned the Englishman may be tempted to London. BBC Scotland understands that the Ibrox club will offer Warburton an improved package to fend off the advances of the Championship side. Fulham are the latest in a list of five clubs to target the Rangers manager. The Englishman is stressing he is going nowhere and money is not a motivation for him. 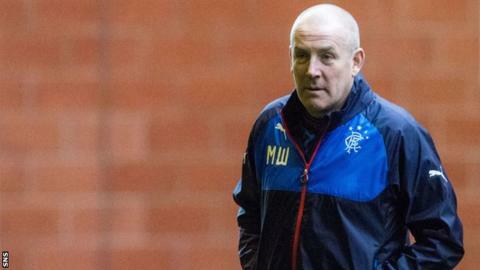 Warburton tweeted on Wednesday that he was "going nowhere and no club has approached me". Fulham have identified Warburton as a candidate to succeed Kit Symons. On Tuesday, Warburton said after his side's 4-0 Scottish Championship victory over Dumbarton: "We're into a long-term project at Rangers and we're in a good place right now. "I respectfully always answer questions. "I'm manager of Rangers and it's disrespectful to Rangers and to a club like Fulham, who conduct their business in the right manner. "I'm sure they'll be disappointed in these rumours." And, on Twitter on Wednesday evening, the manager said he was "bemused and frustrated by shockingly incorrect stories from certain media outlets". Fulham missed out on Reading manager Steve Clarke and Birmingham City boss Gary Rowett. Warburton, who is from London and has members of his family living in the city, has spoken to Rangers chairman Dave King about the possibility of adding to the club's squad in the January transfer window. The former Brentford boss arrived at Ibrox in the summer and has led Rangers to the top of the Scottish Championship. Fulham are 13th in the Championship south of the border, with former Celtic midfielder Peter Grant in caretaker charge of the first team. The Scot wants to retain his role with the development squad. The search for a new manager is being conducted by chief football officer Mike Rigg, who was previously technical director at Queens Park Rangers and Manchester City.